Quotation of some decent K-probes got relatively high pricing, like 20-30 $USD per probe, shipping excluded. Sometimes that’s too much for two pieces of wires welded together. There are a lot of various types of thermal probes using different metals for electrodes. But we may actually interested in two types: well-known Type K and Type T.
Type K is widely used, and consist of two wires of different metals. Optimal operation temperatures are from 273K to 1500K. These are not very well suited for LN2 (cheap probes often show you near -175C in boiling LN2), but good ones are close to real temperatures. One side of wires ends welded into hot junction, and other side is just connected to two electrodes (high-quality ones use same metal for connectors too). And working range is sub -200°C to few hundreds. You can get thermal coupling junction even with just twisting two bare metal wires. But the point is to have solid connection, which is reliable and robust. This is only archived by welding two metal tips in one ball at end. Graphite brush from any AC motor, etc. And 10 minutes to accomplish task. I bought some random brush for AC motor, for 2$. We need graphite brush to act as electrode, because if we just push electricity to melt wires in bare air – evil oxygen will oxidize hot metal and we get nothing but crappy thing with oxidation. That’s wrong way. But if we use graphite piece – carbon burns and acts as shield from oxygen. So this way we will get much more better welded junction. I’ve fixed brush with small clamp. Also metal jaws of clamp act as connector to brush electrode. Then we clean up wires of out future probe. One wire here is alumel, second is chromel. Next step – prepare power cabling. I’ve just used 8pin CPU cable via male receptacle with two copper AWG6 wires. One will hold our thermocouple struck, another will be connected via metal clamp to brush. Next step – turn both wires together, to have it nicely fixed. And now apply power from PSU to electrodes and gently touch brush with thermocouple wires tip. If wires are thin – use current limiting resistor to prevent excessive burn. Take care to do this step on well vented room, or better open air , because carbon burns heavily. Also I’ve tried some industrial grade thick thermocouple wiring (Alumel and Chromel too). Here’s example with Omega 30 meter wire from eBay, welded together with PSU. 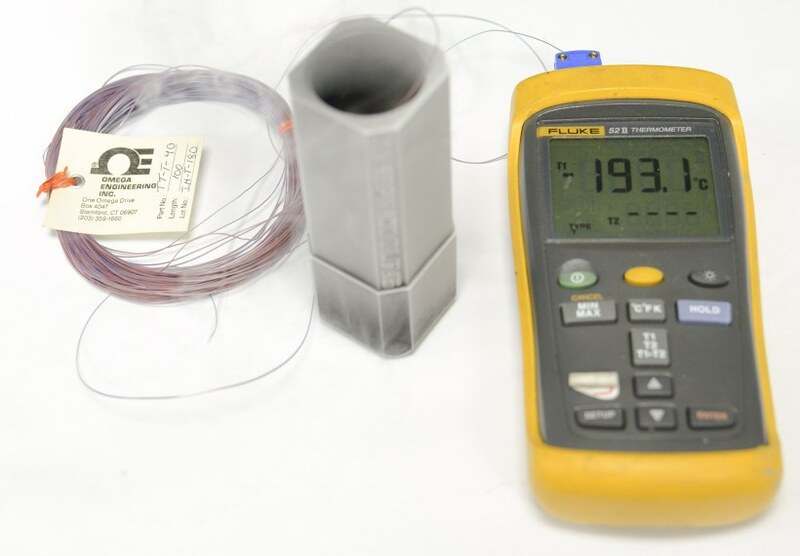 Type T is much more consistent for LN2 temps, always get -190…-195c even with bad weld, but not as common as Type K.
Another example, with high-quality Omega Type-K AWG28 thermocouple wire, using precision Keithley 2001 multimeter and thermos of LN2 as verification point. Hope this may help somebody. Also you can buy few long thermocouples and cut them and weld to some usable probes. Published: July 25, 2015, 2:37 p.m. Modified: April 9, 2016, 1:55 a.m.